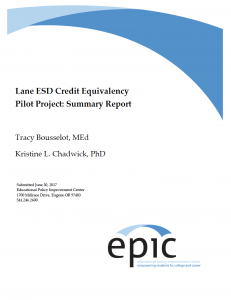 The Educational Policy Improvement Center (EPIC) conducted an implementation study for a credit equivalency pilot project during the 2016–17 school year. Teacher teams from five Oregon high schools participated in the project, developing the frameworks for and providing Career Technical Education (CTE) classes within their schools that offer students the opportunity to earn content area credit. The purpose of the study was to begin to identify the policies and practices that need to exist to ensure integrity when enacting a course equivalency process, leading to positive college and career readiness outcomes for students. We gathered data throughout the year from project participants – including CTE teachers, content area teachers, administrators, students, and project technical assistance providers – to examine individual and common successes and challenges reported across schools in order to provide lessons learned and recommendations for moving forward in the process of establishing rigorous and equitable core academic course equivalency programs. Schools that participated in the pilot project shared a number of common elements, including strong and involved administrator support and a well-established culture of career and technical programs designed to meet local workforce needs and student interest. All schools experienced successes in their implementation efforts, including offering at least one term of course equivalency credit in science, math, or ELA to students and developing curriculum maps aligned to content area standards through a collaboration between the CTE and content area teacher. Most students did not know that they would have the opportunity to earn content area credit until after they had signed up for the pilot class. However, students were able to verbalize how the possibility of earning content area credit within CTE classes may help to expand opportunities for all students in a variety of ways. Challenges to implementation included continued uncertainty about the administrative details involved for assigning course codes needed for appropriately transcripting the course equivalent credits, assigning credits using local student information systems, and varying degrees of internal communication within and between departments in participating schools.